Erick Gantt, Engineering Specialist on the Technical Support Team. I mesh in a highly structured manner! I grew up in south Georgia, and graduated from Georgia Tech “several” years ago with a Bachelors in Aerospace Engineering, Cooperative Plan. As a Co-op at Georgia Tech I commuted to Fort Worth, TX every other quarter to work at the General Dynamics, Fort Worth Division. It was an incredible experience and opportunity as an undergrad. After finishing up at Georgia Tech I went on to North Carolina State to study hypersonics and CFD. After a few years in grad school I returned to General Dynamics full time. There I spent several years in CFD applications (see my meshing specialty below) making grids, running the in-house solver Falcon, and post-processing the results for my internal customers, mostly propulsion and aero performance guys. 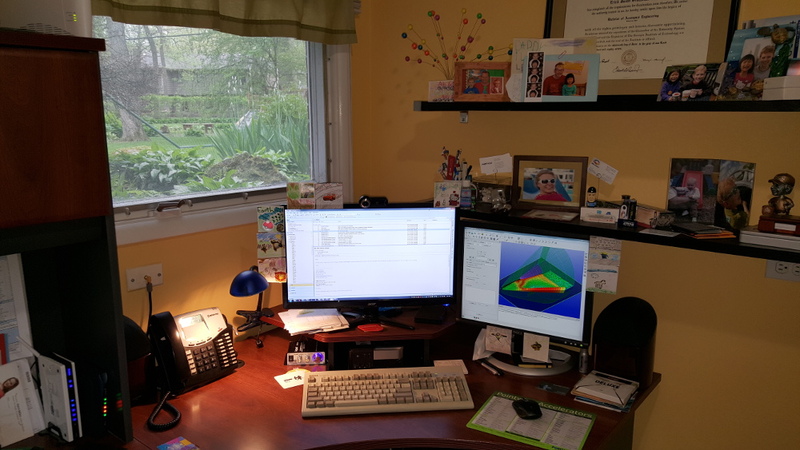 After acquiring several years experience using Gridgen, and developing a strong working relationship with the founders of Pointwise, an opportunity came along for me to become their first employee. Then and now, I provide support, training and documentation. I’ve worn some other hats along the way. 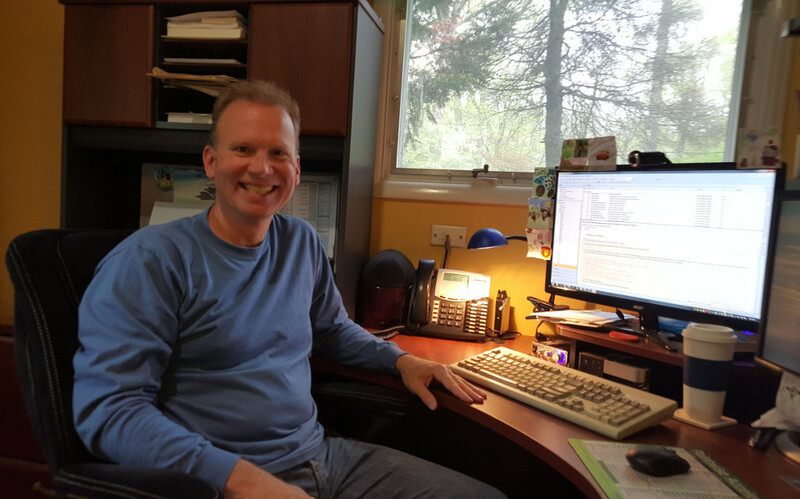 I just celebrated 18 years at Pointwise this past January! I use Outlook for all of my email communication with customers and co-workers. Adobe FrameMaker 12 is the tool I use for creation/editing of all of our Pointwise documentation, such as the User Manual. I also use PowerPoint for creating and delivering our training material both for our regular courses and for special events like last fall’s Pointwise UGM in Anaheim. To satisfy my long history of vi use to edit any text files, such as Glyph scripts, I rely on gVim. There are plenty of other tools I use, but these are the regular mainstays of my work. And, of course, I’m constantly running Pointwise in support of our customers, to create new documentation, and perform consulting work when that comes along. I’ll use our current release and sometimes previous releases for support of customers, as well as our development builds for testing and documentation work. Since I work remotely I have a dedicated home office. I have a cool corner style desk with a built-in monitor shelf and CPU cubby. I have enjoyed this setup for several years. My Windows workstation is set up with dual monitors which make documentation work go so much more easily. Yes, I have an old Dell QuietKey keyboard, I love that thing, and a requisite music system attached. And as you can probably see in my picture my kids are always helping me decorate my work surroundings. I have the usual souvenirs from travel, family pictures and other typical office knick-knacks. I also have a nice portal to the outdoors, allowing me to enjoy fine views of Chicago weather and count the inches of snowfall in the winter. Being in support, my “currently working on” changes daily! But that’s part of what makes this job fun and always fresh. One of my primary responsibilities in our support group is to look after our international distributors. When they have questions, I’m their first line of support. I’ve had a number of interesting queries from them I have been working on the past several days. I have also been working a lot recently on training, both scheduling and delivering courses, and working on the training documentation itself. Next up? Overset material for discussion at our Let’s Talk Meshing sessions at AIAA Aviation in Dallas this June! For new users, definitely make use of our training. If you attend a course in Fort Worth, it is free for current customers! We take you through the whole code starting with basics and finishing up with more advanced skills. So get trained! Let us know when something isn’t working! Too often we will hear at a conference or meeting from a user “when are you going to fix bug xxxx?” And we reply, “well, we didn’t know about bug xxxx.” Let us know if something doesn’t seem to work right. Sometimes, it may just be the task is intended to be done with a different feature. There are a number of things I could talk about here. But I’ll pick a couple of the most recent from two different aspects of my work. First, I have to say I have been pretty proud of our standard training course. When we first released Pointwise V16, I developed an all new course for the software that took a new approach to our training from what we previously used for Gridgen. I wanted a more interactive, project oriented approach to the material, and that’s what we have. We generally get very good feedback from our training courses. Of course, the material is constantly evolving, and like any project that’s close to you, you can always think of new things to add or improve. My second recent project I’m proud of is a consulting project I worked on with Nick Wyman, our Director of Applied Research. Unfortunately I can’t say much about it, but it was a very complex mult-block structured grid, we turned it in on target, with the target characteristics, and well, it just looked amazing! I actually don’t use our supported solvers or a post too much. But I would say I use ANSYS Fluent most often simply to test our CAE export from time to time for customers with questions. In the past I’ve mostly run FIELDVIEW as a post processor, for the same reasons. We are doing some work on meshes for the folks involved with the Sonic Boom Prediction Workshop. I have mostly been recently reading some technical presentations shared among the workshop group, but I look forward to some papers on the topic coming this summer at AIAA Aviation. This is very interesting work impacting hopefully the next generation of air transport. I’ll be at AIAA Aviation, as a matter of fact. We will have a cool Let’s Talk Meshing session on the Sunday prior for folks who want to hear about some of our newest features. And I will be around during the week talking to folks at our exhibit booth. Come by and see us! Oh boy, this could be another long list… But a high priority is of course my two kids, their school and activities. I try to take care of myself, so I bicycle regularly. I’m very lucky to have some natural trails nearby that run along the Des Plaines river here in the burbs, and I bike the trails as much as I can. I also have a nice 46 gallon freshwater aquarium that I love to look after. And when I have the time, I love to read, about my hobbies, and good hard SciFi. “Give up on thinking that you can create a grid on the geometry as it is exactly.” And I’m not talking about geometry that has gaps, overlaps, that sort of thing. I’m talking about back when I was creating mult-block structured grids daily on complex geometries. Invariably for that type of mesh, on a complex geometry, somewhere along the way you will have to modify the geometry in order to make the grid topology work. Of course when I started that work, right out of school, I thought it could be meshed exactly. I don’t do those types of grids as much these days, but that advice will always apply. Since I work remotely, I’ll take the opportunity to pick a place at home and back in Fort Worth where our main offices are. Back in Fort Worth, I can say without a doubt, since I’m a Tex-Mex indulger, that Joe T. Garcia’s is my hands down favorite place to stop by when I’m in town. There are so many great places in Fort Worth, though, I could make a list. Here at home, a recent favorite is Lai Thai. They have some yummy curry dishes, but their Pad Thai noodles are to die for. This entry was posted in People & Places and tagged AIAA Aviation, CFD, Dell, FIeldView, Fluent, food, Let's Talk Meshing, Pointwise, This Is How I Mesh, training, vi, vim, workshop. Bookmark the permalink.